At least two pounds of grapevine must be removed from vines yearly to promote fruit production among the remaining vines, according to the Iowa State University extension program. Although you can discard these vines, you can treat them as a secondary crop. With some creativity, you can turn them into grapevine furniture and wreaths, which you can then sell as rustic home furnishings through local craft stores or at craft festivals. Strip all leaves from the grapevines, but leave the tendrils in place. Cut the grapevines into lengths that are 6-feet long. Soak the vines in a stock tank or bathtub filled with water until they are pliant. Brittle grapevines will break if you try to manipulate them. Bundle six to eight grapevines together. Each grapevine should vary in thickness from ¼-inch to 1-inch thick. The combined diameter of all the grapevines should be no more than 2 inches thick. The wreath will look better if all of the grapevines are different thicknesses. Tie the bundle at each end with natural colored twine. 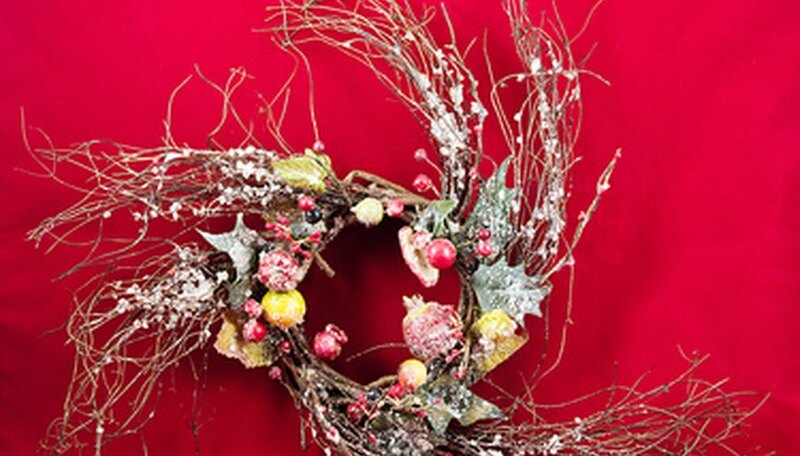 Wrap the wreath around the metal disk, such as a steel drum, trash can or a tire rim. You will be able to wrap the wreath three or more times around a smaller disk, or once around a larger disk. Hide the tied grapevine ends under layers of grapevine. Secure the ends of the grapevine to the newly formed wreath with another length of twine. Allow the vine to dry and harden into its new shape before removing it from the metal disk. Cut grapevines that are between 2- and 3-inches thick into pieces that are 6 feet long. Soak these grapevine pieces in water in a stock tank until the vine is pliant. Wrap the grapevine around wooden garden benches, tables or chairs that have been left their natural color. Affix the ends of the vine to the furniture with a hammer and nails or by tying them in place with twine. Allow the vines to dry and harden into shape before using the furnishings.